Vasilisa Pantelei is a special girl. Her 10th birthday is coming soon and the only gift the girls dreams about is a new wheelchair. 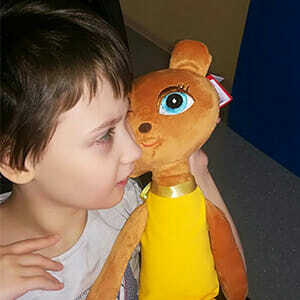 Vasilisa is diagnosed with cerebral palsy. Maria, Vasilisa’s mother, cannot make her child’s dream come true – a wheelchair is too expensive for a single woman. Mom and daughter live in a small flat in Minsk. Every morning they go by tram to the correctional center for disabled children. Then Maria goes to work, and the girl spends all day in the correctional center. Vasilisa does not hold her head, does not sit, does not speak, does not see. But still she has two pleasures in life – listening to her mother playing piano and evening walks through the Sevastopol Park on their way home. But time flies so fast – and the wheelchair of the girl is now too small for her. It’s hard to imagine how difficult the life of this small family is, but they have something that gives them courage for their day-to-day struggle – they have faith. Faith in people! The woman believes that we will help her make Vasilisa’s dream come true and on March 30 the girl will get a new wheelchair.